As published on LinkedIn Influencers on July 30th, 2018. Yes, I know. I know I said that I had written my last post about Wonder Woman. And then I said it again. I’ll probably say it again at the end of this post as well, but at this point I don’t think anyone will believe me, because I’m pretty sure I will always have another Wonder Woman post to write. Cool stuff just keeps happening! For instance, recently I was invited to record a podcast for This Movie Changed Me with Lily Percy and the On Being Studiosabout last year’s Wonder Woman film.They reached out to me due to my many, MANYposts and articles over the years about not just the movie, but the character as well, and I readily accepted their invitation. The episode was released a couple of days ago, and I’m beside myself with joy for many reasons. Here’s my top five! You can find the link to the episode HERE. 1) Podcasts are cool. Over the last several years we have seen this medium explode in popularity, and for good reason. It has become much easier for people to produce a quality podcast, and more importantly, it’s become much easier for audiences to connect with it, meaning it’s easier than ever to access stories from an incredibly diverse set of voices. 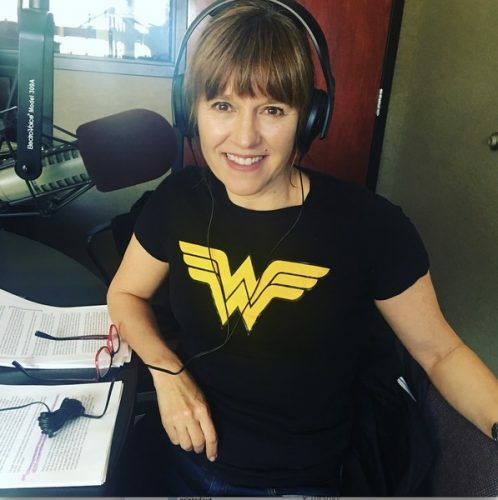 I have often thought about starting my own podcast where I interview incredible people who share my passion for advancing gender equity, and that still may happen. In the meantime, I invested in a startup company called Wait, What? that produces and creates podcasts because I thought the founders were fantastic, and so far this company is doing really well. Their first property was Reid Hoffman’s Masters of Scale, a podcast that focuses on how companies can grow from fledgling startups to successful enterprises, and it was the first American media program to commit upfront to a 50-50 gender balance for guests. Needless to say, I am on board with that! 2) I will talk about Wonder Woman with anyone who will listen, so to be invited to do so by a studio that I respect so much was a dream come true. On Being Studios is the production company founded by Krista Tippett in 2013 to produce and distribute Tippett’s growing network of podcasts. It began in 2001 with a monthly radio show called Speaking of Faith, but has since grown into the weekly On Being podcast that now reaches over 1.5 million listeners monthly. I discovered this podcast a couple of years ago and quickly devoured every episode. I’ve since been fortunate to get to know Krista and I feel privileged to call her a friend. To get to participate on one of her shows, talking about something that means so much to me, was truly an incredible experience. 3) This recording felt like the culmination of a journey many years in the making. In 2011, I asked my writing partner, Laura Moore, to work with me to prepare a report on the character of Wonder Woman, and specifically to look into why we still didn’t have a Wonder Woman movie, but characters like Batman, Superman, and Spider Man were already on their second incarnations. For the record, that was 2011. All three of those characters are now on their third iterations. Just saying. What began as a simple question eventually became a two year project and a 70 page report, and while I won’t go into all the details, the gist of the findings was that there was no good reason to not have a Wonder Woman movie on the big screen. We called out Hollywood on this lack of representation and demanded that Wonder Woman finally get her due. We released this report in April of 2013, and by the end of the year Gal Gadot had been cast in the role of Wonder Woman for the upcoming Batman vs. Superman film, with plans for her solo film to be released shortly after. Now, far be it for me to take all the credit for getting the ball rolling on this, but I have to say that the timing is an awfully big coincidence. 4) I have written extensively about Wonder Woman both on LinkedIn and on my personal website, with some posts going back over 10 years. With the help of Laura, I have decried over and over again the lack of female superheroes to be role models for young girls, and specifically the outrageousness of the notion that we got three Spider Mans across six films before we got to see Wonder Woman. For me, it wasn’t just that I love this character and wanted to see her on the big screen. It was about how the media views women in general, and how it is possible to tell the story of a woman who is powerful, courageous, and brave, and at the same time unapologetically feminine. To tell a story where leading with love is seen as a strength and not a weakness. Where women lead by example, and where they are fully formed characters who are allowed to be both strong and vulnerable, conflicted and compassionate. It’s a narrative that has been sorely lacking in Hollywood, and it’s time for this narrative to take center stage, because if the box office and critical reception to Wonder Woman are any indication, audiences are just as hungry as I am for these types of stories. After 10 years of writing about this, I was thrilled to get to share my knowledge and passion around this subject, and to bring it to the wider On Being audience. 5) Finally, I loved doing this podcast because this movie truly did change me. I was extraordinarily lucky to get to go to the premiere in Hollywood last year, and I’m not going to lie, more than a few tears may have been shed at finally getting to see the movie I had been waiting for decades to see. Not just a Wonder Woman movie, but a truly great Wonder Woman movie that embodied so much of why this character is so special and important to me. While waiting for this film to to come to the big screen I had been working full time as a champion for gender lens investing and philanthropy, and the timing of the film marked a landmark in my own journey trying to be a super shero: being named Co-Founder of Women Moving Millions. Now, and forever more, these two events are connected and it feels like a before and an after. This post would feel incomplete without mentioning my favorite scene in the whole movie, and one I had a chance to talk about on the podcast. The scene where Wonder Woman comes into her own as a superhero as she marched across No Man’s Land. Clearly my enthusiasm was shared by others – just listen to the cheers in this video to this truly amazing moment. In closing, Wonder Woman proved once and for all that Hollywood is capable of producing fantastic stories about incredible women, and I will keep campaigning for more films like this until there are just as many female role models as there are male role models for all the little girls and boys out there. And if you are wondering if there will be a sequel, the answer is a big YES! It is already in the works. And that folks, is my last post on Wonder Woman. And a big thank you to Laura for sharing my love for Wonder Woman and being with me every step of the way. PS – if you have a favorite podcast, please feel free to share it in the comment section and why you love it! As published on LinkedIn Influencers on February 16th, 2018. I’m not exactly what you would call an early adopter of technology. I love it, but I don’t always take to new technologies right away. That being said, once I figure it out, I usually become a ferocious consumer, which is a pretty accurate way to describe my initiation into the world of podcasts. I may have been late to the podcast party, but now that I’m here, I can’t get enough. Whether it’s in the car, on the elliptical, or taking my dogs for a walk, there’s never a bad time to catch up on my podcasts. While there are literally hundreds of thousands of podcasts to choose from, there’s one that is heads and tails above the rest as far as I’m concerned, and if you’re not listening to On Being, I’m not going to lie, I may be judging you right now. Just a bit. Hosted by Krista Tippett, On Being is a weekly podcast that discusses some of the most basic, and most profound, questions in life. What does it mean to be human? How do we want to live our lives? You know, the easy questions. Except that they’re not easy at all, and in fact are incredibly complicated questions that require extraordinarily sensitive and respectful discussions in order to get anywhere close to an answer, and this is where Krista excels. Guests on the show range from scientists and religious leaders, to artists and teachers, and while you may have heard of some of her guests, such as Maya Angelou, Desmond Tutu, Sheryl Sandberg, Yo-Yo Ma, Martin Sheen, Eve Ensler, and the Dali Lama, I know I hadn’t heard of the majority of her guests before listening to their episodes. However, after hearing what they had to say, I’m happy that On Being provided the introduction, as their discussions with Krista are always thoughtful, insightful, illuminating, and just downright incredible. With episodes dating all the way back to 2001, there are hundreds to choose from, but if you’re looking for recommendations, please check out 5 of my favorite episodes below. I just listened to this podcast yesterday and it is so, so, so good. If you do not know Brene’s work, I’m judging you again. Check out her many books and TED talks HERE. Together, Brene and Krista take on the issue of belonging. It’s a big one and it’s an important one, and it goes to the core of who we are as human beings. Such a great episode. Go. Listen. I am blessed to personally know these two amazing people, and I cannot get enough of either of them. You may know Courtney from her many books and TED talks, and Parker, well, he is a legend, and one of his many books, Let Your Life Speak, was a game-changer for me when I read it almost 20 years ago. I have listened to this episode over and over again. Sheryl suffered an unimaginable loss when her husband, Dave Goldberg, passed away suddenly in 2015. In this touching podcast she opens up about her loss together with her dear friend Adam Grant. I learned so much from listening, including how to support a friend who had recently also suffered an unimaginable loss. Before On Being I had not heard of Maria and Brain Pickings. Now I know and I am the better for it. There were so many great lines and incredible observations in this podcast that I found myself pausing it, hitting replay, and then pausing it again to process. Here is one of them. “Thinking,” she says, “is not the same as judgment, but it creates the right conditions for judgment.” Since last year was the year I was committed to thinking about my thinking, this podcast was a perfect fit. Beyond her incredible podcasts, there are many other reasons to jump over to the On Beingwebsite. In 2013, Krista expanded her operations by starting her own production company, Krista Tippett Public Productions, in order to produce future episodes of On Being. Since then, this company has gone on to launch several additional podcasts, conversational and writing projects, and 2016’s Becoming Wise: An Inquiry into the Mystery and Art of Living, a book that once again tackles the ever simple question of how to live a life of wisdom, and where exactly that wisdom can be found. Needless to say, it’s one of my favorite books and I can’t stop recommending it to everyone I meet. This weekend, Krista is further expanding her enterprise once more by hosting the first ever On Being Gathering in California at the 1440 Multiversity, and I couldn’t be more excited to be one of the inaugural attendees along with my husband and daughter. 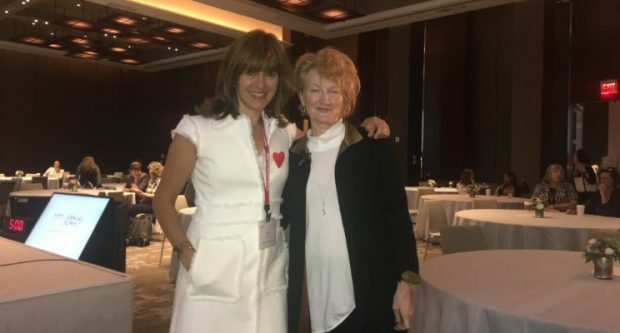 Billed as three days of “conversation, poetry, and community with Krista Tippett, beloved teachers from the show and the blog, and the entire On Being team”, I can’t wait for the retreat to get started later today. In today’s divided and fractured times, I look forward to my weekly appointment with On Being, because every time I finish an episode, I’m reminded that civil, respectful, and productive conversations are possible, even between those who couldn’t be farther apart in their opinions, and this is something that our world desperately needs right now. And in case you were wondering why I’ve been referring to Krista in the informal first name basis for this article, it’s because I’ve been lucky enough to get to know her over this past year and to call her a friend. I can assure you, she’s just as incredible in person as she is on the podcast, so go subscribe now. You’re welcome. PLEASE share your favorite episodes in the comment section if you are already a listener to On Being, or if you have other favorite podcasts, please share those too. Have a great day.